Macroautophagy (hereafter referred to as autophagy) is a highly conserved cellular process that delivers proteins and organelles to the lysosome and　controls the degradation of these substrates to facilitate homeostasis. In addition, it is an important process to adapt the availability of nutrients. Amino acids activate mammalian target of rapamaycin complex 1 (mTORC1), which is the key regulator of the autophagy signaling pathway. The depletion of amino acids negatively regulates mTORC1 and induces autophagy. Recent studies have shown that amino acids recruit mTORC1 to the lysosome by affecting vacuolar-type H+-ATPase (v-ATPase) and Rag guanosine triphosphatase A/B (RagA/B), thereby leading to the activation of mTORC1 on the lysosome and the inhibition of autophagy. Here, we review recent advances in the understanding of autophagy signaling by amino acids and their metabolites. Autophagy degrades cellular cytosolic components by delivering them to the lysosome and is a highly conserved catabolic process in organisms ranging from yeasts to mammals [1,2]. Autophagy plays an important role in basic biological functions, such as intracellular clearance of defective proteins and organelles, differentiation, and development [3-5]. Dysfunctions in autophagy are associated with severe diseases, such as heart disease, neurodegenerative disorders, and cancers [4,6,7]. There are three distinct types of autophagy: macroautophagy, microautophagy, and chaperone-mediated autophagy. Macroautophagy (hereafter referred to as autophagy) comprises bulk degradation and a multi-step process by which the portions of the cytoplasm and/or organelles are sequestered in a double-layered membrane structure called the autophagosome. This autophagosome then fuses with a lysosome for degradation. The autophagosome–lysosome structure is called the autolysosome . For many years, it has been known that autophagy is activated by starvation, including amino acid depletion and it controls the concentration of free amino acids . Although the detailed mechanism related to the control of autophagy by amino acids has not been completely clarified, it has been shown that the mammalian (or mechanistic) target of rapamycin complex 1 (mTORC1) is the key regulator of autophagy by amino acids [9-12]. In this review, we focus on the regulation of autophagy by amino acids and their metabolites as well as recent advances in studies of the regulation of mTORC1 by amino acids. The processes involved in autophagy include the stages of initiation, during which an isolation membrane (phagophore) is formed, elongation and closure, during which a complete autophagosome is formed, and maturation, during which an autolysosome is formed by the fusion of an autophagosome and a lysosome . It has been reported that amino acid depletion induces autophagy. However, recent studies indicated that various stimulations, including stress, organelle damage, hypoxia, and reactive oxygen species induce autophagy . In autophagy, the key regulator is mTORC1, which controls the initiation stage of autophagy . mTORC1 comprises mTOR, which is a serine/threonine kinase and the main active component, mammalian lethal with SEC13 protein 8 (mLST8, which is also called GbL) , DEP domain-containing mTOR-interacting protein (DEPTOR) , proline-rich Akt substrate of 40 kDa (PRAS40) , regulatory-associated protein of mTOR (Raptor) [18,19], and Tti1-Tel2 . mTORC1 negatively regulates autophagy by repressing the Unc-51-like kinase (ULK)1/2 complex, which is an initial regulator of autophagy. The ULK1/2 complex comprises ULK1/2, ATG13 , and focal adhesion kinase family interacting protein of 200 kD (FIP200) . When cells are in nutrient-rich conditions, mTOR gets activated and inhibits the kinase activity of ULK1/2. On the other hand, when cells are in amino acid-depleted conditions, mTOR is inactivated and ULK1/2 is activated. Activated ULK1/2 autophosphorylates and then phosphorylates ATG13 and FIP200, and then produces the phagophore to initiate autophagy. In yeast, ATG8 plays an important role in the elongation and closure stage, during which an autophagosome is formed. The ATG12–ATG5–ATG16 complex conjugates phosphatidylethanolamine (PE) with ATG8 to produce ATG8-PE. ATG8-PE mediates membrane fusion and elongates the phagophore to complete autophagosome formation. In addition, ATG8 brings substrates, such as aggregated proteins or damaged organelles, into an autophagosome . Mammalian orthologs of yeast ATG8 have been identified, which are divided into the microtubule-associated protein 1 light chain 3 (LC3) subfamily and the g-aminobutyric-acid-type-A receptor-associated protein (GABARAP) subfamily. The LC3 subfamily contains LC3 alpha (LC3A), LC3 beta (LC3B), and LC3C. The GABARAP subfamily contains GABARAP, GABARAP-like 1 (GABARAPL1), and GABARAP-like 2 (GABARAPL2) [23-27]. LC3B has been studied most extensively in these subfamilies. Similar to yeast ATG8, LC3B is conjugated to PE via the cooperation of the ATG12–ATG5–ATG16 complex to form an autophagosome . The membrane sources of the autophagosome include the endoplasmic reticulum [28,29], mitochondrial membrane , plasma membrane , Golgi , and recycling endosomes . After autophagosome formation is complete, the autophagosome fuses with a lysosome to form an autolysosome. The fusion between an autophagosome and a lysosome is mediated by Rab7 [34,35], homotypic fusion and protein sorting (HOPS) complex , UV radiation resistance-associated gene protein (UVRAG) , and soluble N-ethylmaleimide-sensitive factor attachment protein receptors (SNAREs) [38-40]. A recent study indicated that the phosphorylation of LC3B by serine/threonine kinase (STK) 3 and STK4 is also necessary for the fusion of an autophagosome and a lysosome . On the other hand, mTORC1 phosphorylates UVRAG to inhibit the fusion of an autophagosome with a lysosome , indicating that mTORC1 negatively regulates the autophagy process not only at the initiation stage but also during the maturation stage. Finally, the enzymes in the lysosomes or autolysosomes degrade the substrates brought by the autophagosomes. Amino acids are transported into the cell from outside by solute carrier (SLC) superfamily proteins, which are membrane-spanning amino acid transporter proteins . It has been reported that amino acids (particularly leucine, glutamine, or arginine) activate mTORC1, thereby blocking the autophagy pathway [9-12]. However, it is still unclear whether mTORC1 signaling is affected by one specific amino acid or by a combination of amino acids. Some amino acid transporters are antiporters, which require an extra amino acid for transport. For example, glutamine is imported into the cell by SLC1A5, and the imported glutamine is then exported by the bidirectional amino acid transporter SLC7A5, which transports the extracellular essential amino acids into cells [11,44]. This indicates that extracellular amino acid signaling is not the same as intracellular amino acid signaling. Therefore, it is difficult to separate the signals of amino acids received from outside the cells. In addition, amino acid metabolites regulate mTORC1 signaling. Nitric oxide (NO) and citrulline are produced from arginine by NO synthase. NO inhibits autophagy via the S-nitrosylation of JNK1 and IKKb. JNK1 phosphorylates Bcl-2, which binds and inhibits Beclin 1. Phosphorylated Bcl-2 releases Beclin 1, which then initiates autophagosome formation. In addition, IKKb phosphorylates AMPK, which then phosphorylates tuberous sclerosis 2 (TSC2). Phosphorylated TSC2 is a negative regulator of mTORC1, which induces autophagy . Citrulline stimulates the phosphorylation of 4EBP1 and rpS6, which indicates mTORC1 activities; thus, citrulline is considered to be a candidate regulator of autophagy . The metabolization of glutamine, which is called glutaminolysis, is processed by glutaminase (GLS) and glutamate dehydrogenase (GDH). GLS catalyzes glutamine to generate glutamate and ammonia. GDH catalyzes glutamate to generate a-ketoglutarate (aKG) and ammonia. It has been reported that ammonia induces autophagy, but the induction of autophagy by ammonia is independent of the mTORC1 and ULK1/2 signaling pathway [47-49]. By contrast, aKG activates mTORC1 signaling and blocks autophagy [50,51]. The metabolization of arginine, histidine, or proline also generates KG. Therefore, the balance between aKG and ammonia may be important in the regulation of autophagy. Specific leucine metabolites do not induce mTORC1 signaling ; however, leucine activates GDH via allosteric regulation to increase glutaminolysis, which regulates mTORC1 . Thus, amino acids and their metabolites may affect mTORC1 and autophagy via complex signaling pathways. mTORC1 is recruited to the lysosome and is activated by GTP-loaded Ras homolog enriched in brain (Rheb) on the lysosome. Several protein complexes play important roles in activating mTORC1 on the lysosome by amino acids (Figure 1). The biological substances that affect mTORC1 and autophagy are summarized in Table 1. Figure 1. Regulation of mTORC1 and autophagy by amino acids. Amino acids are sensed by v-ATPase in the lysosomal lumen. v-ATPase and Ragulator change their conformation, resulting in the conversion of RagA/B into the GTP-bound state by the guanine nucleotide exchange factor (GEF) activity of Ragulator. The active GTP-bound RagA/B recruits mTORC1 to the lysosome, where Rheb activates mTORC1. Activated mTORC1 blocks autophagy. The mechanism involved in the transport of amino acids to the lysosomal lumen remains unclear. In the cytoplasm, the GTPase-activating protein (GAP) activity of GATOR1 converts RagA/B into the GDP-bound state. GATOR2 inhibits the GAP activity of GATOR1 and Sestrins inhibit GATOR2. The inhibitory effect of Sestrins on GATOR2 is blocked by amino acids and the amino acids then activate RagA/B. In low amino acid conditions, RagA/B is converted into the GDP-bound state, which cannot bind mTORC1. The inactive mTORC1 is unable to inhibit ULK1/2, thereby leading to the induction of autophagy. mTORC1 is recruited to the lysosome surface in amino acid-rich conditions. Rag guanosine triphosphatase (GTPase) heterodimers found on the lysosomes are the key players in the translocation of mTORC1 to the lysosome membrane by amino acids. In mammals, four Rag GTPase have been found, namely RagA, RagB, RagC, and RagD [53,54]. Unlike other small GTPases, Rag GTPases have no lipid anchor and they form a heterodimer that comprises RagA or RagB with either RagC or RagD. The GTP or GDP states in Rags are regulated by amino acids. RagA/B binds to GDP and RagC/D binds to GTP in amino acid-depleted conditions, whereas RagA/B binds to GTP and RagC/D binds to GDP in amino acid-rich conditions, the latter state being the active state of the Rag heterodimer. The active Rag heterodimer binds with Raptor in mTORC1, thereby leading to the localization of mTROC1 to the lysosome membrane . Rag GTPases lack a lipid anchor; hence, the Rag heterodimer is localized to the lysosomal membrane by binding to “Ragulator”, a guanine nucleotide exchange factor (GEF) and a lysosomal protein complex, which comprises five proteins, namely p18, p14, MP1, C7orf5, and HBXIP [55,56]. The binding of Ragulator to the lysosomes is possibly mediated by p18, which possesses myristoylation and palmitoylation sites on its N-terminal side . Moreover, Ragulator binds to vacuolar-type H+ ATPase (v-ATPase), which is an ATP-dependent proton pump on the lysosome. The v-ATPase is a multiprotein complex, which comprises V0 (membrane-bound complex) and V1 (cytosolic complex), and it serves as a proton pump to acidify lysosomes . In amino acid-rich conditions, the amino acids inside the lysosome affect v-ATPase and weaken the link between Ragulator and the V1 subunit of v-ATPase, thereby leading to changes in the state of Ragulator. Next, Ragulator converts GDP-bound RagA/B into GTP-bound RagA/B via its GEF activity. The GTP-bound RagA/B recruits mTORC1 to the lysosomal membrane . RagA/B is also regulated by the GATOR complex, which comprises two subcomplexes: GATOR1 and GATOR2. GATOR1 is the GTPase-activating protein (GAP) that changes GTP-bound RagA/B into GDP-bound RagA/B and inhibits the binding between RagA/B and mTORC1. GATOR1 is a protein complex, which comprises DEP domain-containing protein 5 (DEPDC5), nitrogen permease regulator-like2 (NPRL2), and NPRL3. GATOR1 is negatively regulated by GATOR2, which comprises Mios, WD repeat-containing protein 24 (WDR24), WDR59, SEC 13 homologue-like 1 (Seh1L), and secretory 13 (Sec13). In GATOR2, Mios is necessary for the activation of mTORC1 by amino acids . Therefore, GATOR1 is a negative regulator of mTORC1 and a positive regulator of autophagy. On the other hand, GATOR2 is a positive regulator of mTORC1 and a negative regulator of autophagy. Recently, it was demonstrated that Sestrins (Sestrin1/2/3) interact with GATOR2 and are necessary for the complete inhibition of mTORC1 activity in amino acid-depleted conditions [61,62]. 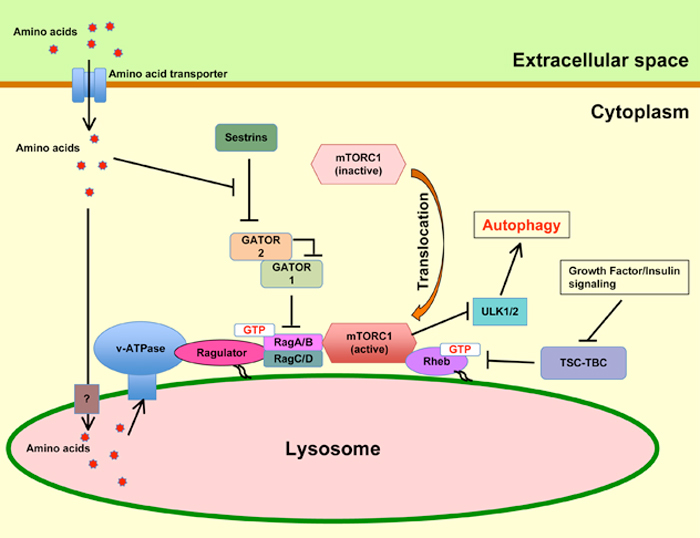 These results indicate that GATOR1 becomes active due to the negative effect of Sestrins on GATOR2 in amino acid-depleted conditions and active GATOR1 inhibits the recruitment of mTORC1 to the lysosome, thereby leading to autophagy. Although Sestrins regulate mTORC1, additional research is needed to clarify the amino acid sensing pathway upstream of Sestrins. mTORC1 is activated by GTP-loaded Rheb on the lysosome membrane . Rheb is a small GTPase and a membrane-binding protein, and GTP-loaded Rheb is the active form. Rheb is negatively regulated by the TSC–TBC complex, which comprises TSC1, TSC2, and Tre2-Bub2-Cdc16 1 domain family member 7 (TBC1D7). TSC2 has GAP activity for Rheb and inhibits Rheb by changing GTP to GDP. The PI3K–Akt pathway, which is related to growth factors or insulin, phosphorylates and inhibits the TSC–TBC complex, thereby leading to the activation of mTORC1 by GTP-loaded Rheb . Amino acids activate RagA/B and recruit mTORC1 to the lysosome. The recruited mTORC1 is activated by interacting with GTP-loaded Rheb on the lysosome membrane surface. Thus, both amino acids and the PI3K–Akt pathway involving growth factors are considered to be necessary for the activation of mTORC1, which inhibits the autophagy pathway. Recent studies of mTORC1 have shown that mTORC1 is a crucial factor related to the sensing and signaling of amino acids in the regulation of autophagy pathway. These include the discovery of mTORC1 regulators, such as Rag complex, Ragulator, GATOR complex, and Sestrins. However, the upstream signal transduction pathway that regulates Sestrins and the detailed mechanisms related to the regulation of v-ATPase by amino acids remain unclear. New technological developments may help to understand the detailed mechanism involved in the sensing and signaling of amino acids to control mTORC1 and autophagy. ©2015 Kiriyama Y. This is an open-access article distributed under the terms of the Creative Commons Attribution License, which permits unrestricted use, distribution, and reproduction in any medium, provided the original author and source are credited. Tokushima Bunri University, Kagawa School of Pharmaceutical Sciences, Shido 1314-1, Sanuki, Kagawa 769-2193, Japan, Tel: +81-87-899-7100; Fax: +81-87-894-0181.